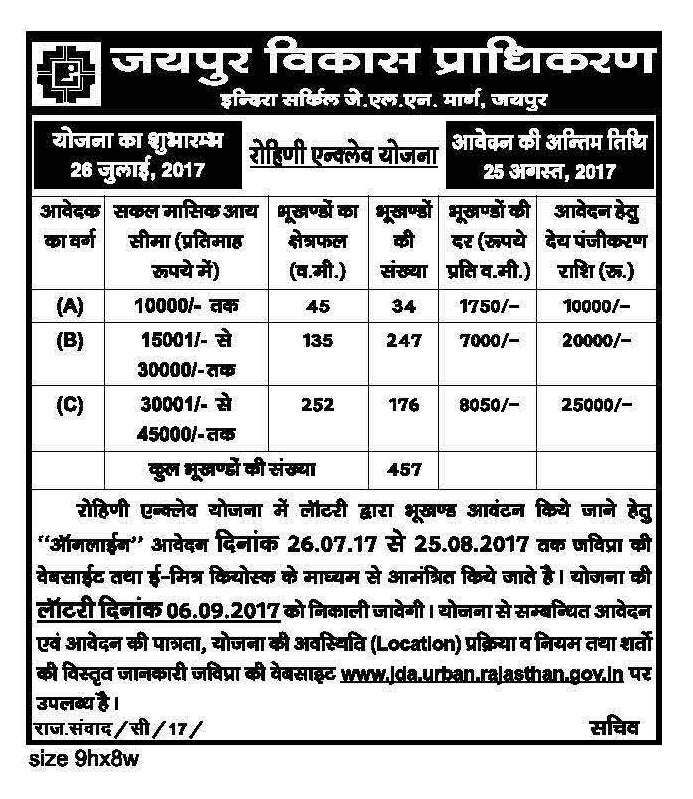 Jaipur Development Authority invites application from general public for the sale of plots in JDA Rohini Enclave Residential Plot Scheme 2017. In JDA new residential plot scheme 2017, the authority has offering about 457 plots for registrations has been started from 26 July 2017. Under JDA new housing scheme 2017, the authority has offering three size of plots including, 45 square meter, 135 square meter and 252 square meter. And most of the housing units are available in the size of 135 square meter. Complete details of plots their size, allotment price, registration amount and number of units mentioned in table below. The process of filling online application form has been started and those who are willing to buy residential plots in Jaipur under JDA Rohini Enclave Residential Plot Scheme 2017 can apply by following the procedure below. Registrations can only be done through online mode by using the official website of Jaipur Development Authority (JDA) at www.jda.urban.rajasthan.gov.in and you can also register through E-Mitra KIOSK. After filling the application form, payment can be mode through Net Banking, Credit Card, Debit Card. Three types of plots are for sale for which income criteria in as follows. For Category-A plots, monthly income of applicant should not be more than Rs. 10,000/-. For Category-B and Category-C plots, monthly income of applicants should be in between Rs. 15,001 to Rs. 30,000 and Rs. 30,001 to Rs. 45,000. The applicant should have a minimum age of 18 years. The applicant should have Aadhaar Card Number. The applicant should have an active bank account number. For further information visit the JDA Jaipur official website.